There’s a certain section of our society who go to a restaurant and act as if they own it, even though they’ll order the cheapest thing on the menu. They forget that the waiters and the rest of the people in there are human beings, and start misbehaving with them. Two such women tried to pull off something like that in an Ukranian restaurant. However, they didn’t get the result they wanted. 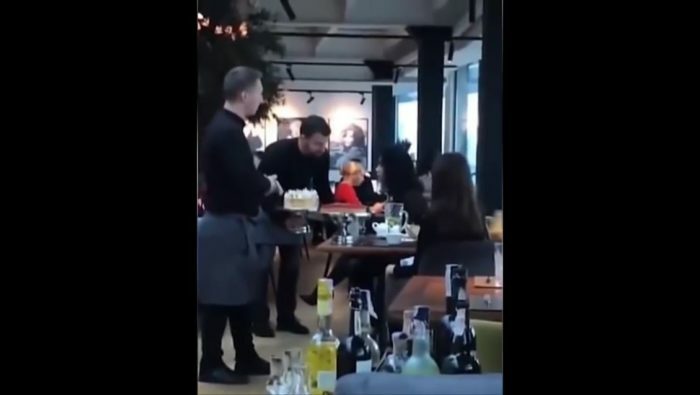 In a video that’s going viral, two women can be seen having a heated argument with one of the two waiters in front of them. And the resolution to that conversation comes in the form of a cake, which can’t be called an appropriate solution, but one that was amusing nonetheless. According to reports, one of the girls (you’ll know which one) said that “Why the f*** would I eat your cake?”. And since they were behaving rudely for a long time, one of the waiters gave her a cake-filled punishment. The Mirror has reported that a restaurant spokesperson has said that the waiters won’t be punished because it was the customers who were being rude and provocative. So, just remember, the next time you try to pull something off, make sure you order what you want to be slammed into your face.